The Philippines is currently in the midst of a transition to a K-12 (also called K+12) basic education system. Education ideally begins with one year of kinder. Once the transition is complete, elementary or grade school comprises grades 1 to 6. Although the term student may refer to learners of any age or level, the term 'pupil' is used by the Department of Education to refer to learners in the elementary level, particularly in public schools. Secondary level or high school comprises two major divisions: grades 7 to 10 will be collectively referred to as 'junior high school', whereas grades 11 to 12 will be collectively referred to as 'senior high school'. The Department of Education refers to learners in grade 7 and above as students. In Iran 12-year school is categorized in two stages: Elementary school and High school. It takes six years for a student to graduate from elementary school and six years for high school. High school study is divided into two part: junior and senior high school. In senior high school, student can choose between the following six fields: Mathematics and physics, Science, Humanities, Islamic science, Vocational, or Work and knowledge. After graduating from high school, students acquire a diploma. Having a diploma, a student can participate in the Iranian University Entrance Exam or Konkoor in different fields of Mathematics, Science, Humanities, languages, and art. The university entrance exam is conducted every year by National Organization of Education Assessment,  an organization under the supervision of the Ministry of Science, Research and Technology which is in charge of universities in Iran. 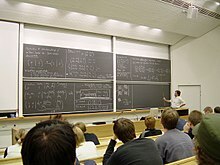 Members of the Bahá'í religion, a much-persecuted minority, are officially forbidden to attend university, in order to prevent members of the faith becoming doctors, lawyers or other professionals; however, Muslim, Christian, Jewish, and Zoroastrian people are allowed entry to universities. In Australia, Pre-school is optional for three and four year olds. At age five, children begin compulsory education at Primary School, known as Kindergarten in New South Wales, Preparatory School (prep) in Victoria, and Reception in South Australia, students then continue to year one through six (ages 6 to 12). Before 2014, primary school continued on to year seven in Western Australia, South Australia and Queensland. However, the state governments agreed that by 2014, all primary schooling will complete at year six. Students attend High School in year seven through twelve (ages 13 – 18). After year twelve, students may attend tertiary education at University or vocational training at TAFE ( Technical and Further Education). The generic term "étudiant" (lit. student) applies only to someone attending a University or a school of a similar level, that is to say pupils in a cursus reserved to people already owning a Baccalauréat. [ citation needed] The general term for a person going to primary or secondary school is élève. In some French higher education establishments, a bleu or "bizuth" is a first-year student. Second-year students are sometimes called "carrés" (squares). Some other terms may apply in specific schools, some depending on the classe préparatoire aux grandes écoles attended. At university, the term "fresher" is used to describe new students who are just beginning their first year. The term, "first year" is the more commonly used and connotation-free term for students in their first year. The week at the start of a new year is called " Freshers' Week" or "Welcome Week", with a programme of special events to welcome new students. An undergraduate in the last year of study before graduation is generally known as a "finalist." Large increases in the size of student populations in the UK and the effect this has had on some university towns or on areas of cities located near universities have become a concern in the UK since 2000. A report by Universities UK, "Studentification: A Guide to Opportunities, Challenges and Practice" (2006) has explored the subject and made various recommendations. A particular problem in many locations is seen as the impact of students on the availability, quality and price of rented and owner-occupied property. In the United States, the first official year of schooling is called kindergarten, which is why the students are called kindergarteners. Kindergarten is optional in most states, but few students skip this level. Pre-kindergarten, also known as " preschool" (and sometimes shortened to "Pre-K") is becoming a standard of education as academic expectations for the youngest students continue to rise. Many public schools offer pre-kindergarten programs. In the United States there are 12 years of mandatory schooling. The first eight are solely referred to by numbers (e.g. 1st grade, 5th grade) so students may be referred to as 1st graders, 5th graders, then once in middle school before high school you are ratio referred to as 6th, 7th, 8th graders. Upon entering high school, grades 9 through 12 ( high school) also have alternate names for students, namely freshman, sophomore, junior and senior. The actual divisions of which grade levels belong to which division (whether elementary, middle, junior high or high school) is a matter decided by state or local jurisdictions. In the U.S., a Junior is a student in the penultimate (usually third) year and a Senior is a student in the last (usually fourth) year of college, university, or high school. A student who takes more than the normal number of years to graduate is sometimes referred to as a " super senior". This term is often used in college, but can be used in high school as well. The term underclassman is used to refer collectively to Freshmen and Sophomores, and Upperclassman to refer collectively to Juniors and Seniors, sometimes even Sophomores. The term Middler is used to describe a third-year student of a school (generally college) that offers five years of study. In this situation, the fourth and fifth years would be referred to as Junior and Senior years, respectively, and the first two years would be the Freshman and Sophomore years. Students attending vocational school focus on their jobs and learning how to work in specific fields of work. A vocational program typically takes much less time to complete than a four-year degree program, lasting 12–24 months. Liberal Arts that are required in four-year Universities are less important to these students because the skills necessary for their careers take precedence in order for a timely completion of the program.
" Freshman" and " sophomore" are sometimes used figuratively, almost exclusively in the United States, to refer to a first or second effort ("the singer's sophomore album"), or to a politician's first or second term in office ("freshman senator") or an athlete's first or second year on a professional sports team. "Junior" and "senior" are not used in this figurative way to refer to third and fourth years or efforts, because of those words' broader meanings of " younger" and " older." A junior senator is therefore not one who is in a third term of office, but merely one who has not been in the Senate as long as the other senator from their state. Confusingly, this means that it is possible to be both a "freshman Senator" and a "senior Senator" simultaneously: for example, if a Senator wins election in 2008, and then the other Senator from the same state steps down and a new Senator elected in 2010, the former Senator is both senior Senator (as in the Senate for two years more) and a freshman Senator (since still in the first term). ^ " The 17th of November: Remembering Jan Opletal, martyr of an occupied nation". Radio Prague.